Permeable and moisture-regulating, water-thinnable opaque wood preservative coating for the exterior, specially for new coats. Based on acrylic-/alkyd resin dispersions. Extremely weather-resistant and colour shade stability. Unlimited variety in colour shades. Protects against blue stain and mould. Certificates The active substances used provide the protection required against blue stain (test conforming to EN 152-1) and wooddestroying fungi (test conforming to EN 113), as specified by ÖNORM B 3803 or DIN 68800-3, and also prevent insect infestation (test according to EN 46). Substrate Softwood and hardwood as well as plywood materials which are suitable for the exterior, such as, for example, solid wooden boards, glued laminated timber (GLT or Glulam) and solid structural timber (SST), etc. Recommended number of paint coats 2. Please also see the technical data sheets! Wooden elements without stable dimensions or with limited stable dimensions in the exterior such as, for example, wooden houses, canopies, timbering, balconies, fences, window shutters and gates in usage categories 2 and 3. Preferably for new wood in the exterior. 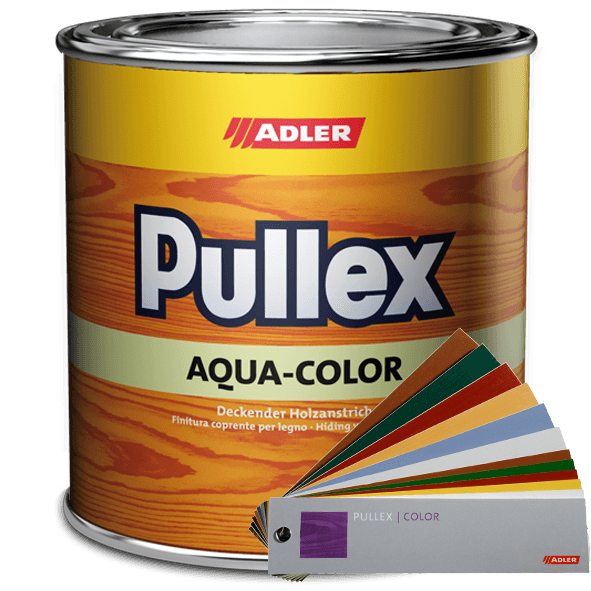 For the renovation of old oil coats we recommend Pullex Color.